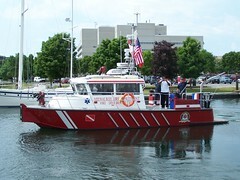 The Milwaukee, WI Fire Department receives a NEW High-Speed 36 foot Aluminum Fire boat!. Lake Michigan and surrounding waterways has a new Bright Red FireStorm 36 stationed near its main port. 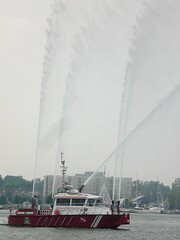 The vessel can hit speeds of 39.4 knots with assistance from twin Cummins, 8.3 L 540 HP and 322 Hamilton jets. With the Darley twin 1750s, Milwaukee pumps a total flow of 4871 GPM. A great feature the new boat has is the advanced Thermal Vision Side Scan Sonar Technology by Marine Sonic side scan and a Night Vision Technologies Infrared Camera. Which is very helpful when on a water-rescue with severe visibility and bridge security. Chief Darrel Moore and his team are excited about the new arrival, which is being delivered by water this month. Five years ago, MetalCraft produced the first FireStorm and has not turned back. Each boat has a unique and personalized flavor chosen by our customers. We have been designing and building boats, both power and sail, since 1978 and stand behind our 10-year hull warrenty.